Thoughts? Get 'em in now before I start coding. I know space is tight, but I'd like to see the following if we can make it work. Resizing of large images is always a possible option to make things fit. You actually proposed this for menu mode a while back and I loved it. We just haven't gotten around to putting that into menu mode yet. 2) Add the image location graphic below the location name. It looks much nicer with it than without it. It will probably need to be resized. I would prefer the face or full body portraits over the sprite, but I see no way to make it fit well in that limited space. In particular I like that they maximized the space for showing data about the highlighted save, whereas we are trying to cram all of that information into several smaller windows. 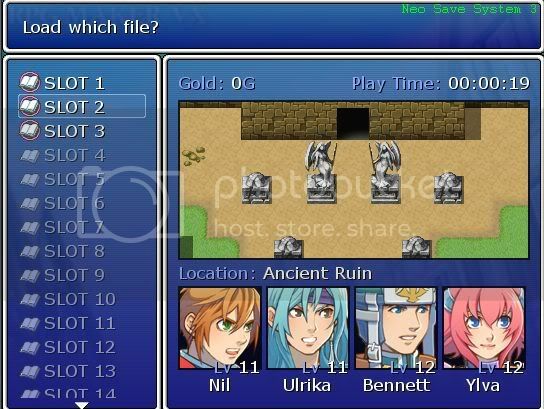 The advantage to doing it the way you initially proposed is its easier to compare multiple save files, whereas with the system shown in the image above, you'd have to select every individual save to see what data it stores. But really, I think the "show only one saved game data" approach is so much more aesthetic and I can't imagine that being able to see multiple pieces of saved data on the screen at once is going to be a feature that is needed at all. Me too. Maybe, additionally, when the images for the faces are ready, you can replace the sprites with them. I'm also for something similar Roots found on the web. per save slot makes it much prettier and recognizable than reproducing a slot n times, IMHO. Thanks a lot to you all for the design work put on this, I know many players will love it at the end. By the way, since you called this thread "SaveMode" does this mean we're going to make a new game mode for loading/saving games? If so I strongly approve of this design. It makes a lot of sense because it maximizes code re-use and allows us to bring up the save/load screen wherever its needed, which from my count now includes BootMode (loading games), MenuMode (saving games), and BattleMode (loading games if the player loses). And who knows, we may want to bring it up in map mode as well as part of a scripted event. Uh, SaveMode isn't a new thing. That's the way I coded it originally. Oh, so it is. Heh, can't believe I didn't see it in the source tree. "It might be nice to have a little window above the top that says "Load which file?" or "Save to which file? ", to make it clear to the player whether they are loading or saving"
Of course we'll also need a confirmation dialogue when saving/loading a file as well.